Luca Canever is a Level 3 TAGteacher, with lots of experience applying TAGteach and teaching others. Luca is a scientist with a keen interest in the brain and how it learns. 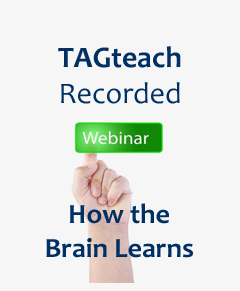 He will talk about recent research into brain science and will explain why it is that TAGteach works so well. Working memory and cognitive load - why we can talk less, yet teach more. Associative learning - what a sea hare and Stephen Hawking have in common. Maps in the brain - why my car is not like yours. Click here to read an article by Luca with some more details about what he will cover in the webinar.